7:55 a.m. - 3:14 p.m. Since the inception of the Oklahoma Academic Scholar Program in 1988, Ada High School has had 329 Oklahoma Academic Scholars. These seniors scored at least 27 on their ACT and graduated with a 3.75 cumulative G.P.A. Ada High School has had 47 National Merit Finalists and 23 Oklahoma Academic All-Staters, considered to be in the top 100 students in the state. 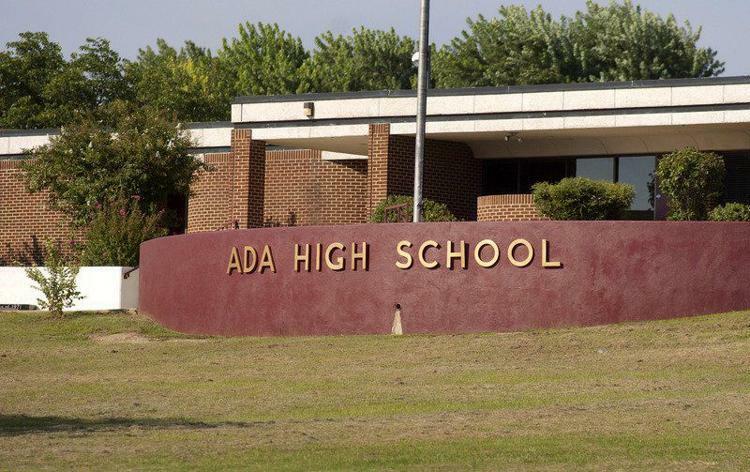 In 2012 Ada High School was listed by ACT as one of the top ten high schools in the state based on composite ACT scores. In 2005 Ada High School was named Oklahoma High School of the Year by the Oklahoma Bar Association. Ada High School has won 130 State Championships in football, basketball, baseball, track, golf, tennis, music, and, dance, mock trial, band, and academics. Currently Ada High School offers 9 Advanced Placement courses. Students may enroll in AP Psychology, Economics, US History, Calculus, Art, Biology, Environmental Science, English Language and Composition, and Literature and Composition. To date Ada High School has had 35 AP Scholars. These are students that have passed at least 3 AP exams. Ada High School has been named one of four high schools in the state to participate in the National Math and Science Consortium. This program is designed to encourage enrollment in advanced coursework in mathematics, science, and English.